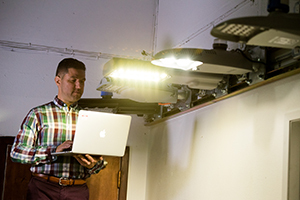 PNNL researchers used the DOE Connected Lighting Test Bed in Portland, Oregon, to learn how various lighting systems share and respond to data. With the growth of the Internet of Things, more people are using devices that connect and share data with each other to customize and improve their environments. Connected lighting systems in buildings and cities are part of this transformation. Manufacturers are starting to make lighting systems that operate as data collection platforms, opening the door to more efficient and customizable energy use. But to reach their full potential, connected lighting systems must evolve to the point where they are easily and efficiently interconnected and configured to share the data that they collect. To help accelerate this evolution, PNNL researchers have completed the first in a series of studies to document the current state of connected lighting and make recommendations for improvement. The ultimate goal: get more connected lighting systems into the marketplace, thereby saving energy and improving the user experience. Imagine your workplace environment being decked out with lighting that senses its surroundings and automatically changes as needed. When you walk into your office, the lights recognize you, adjust to your pre-set preference for warm or cool tones, dim or bright. The lights continue to respond and change as you shift tasks, from working on your computer to meeting with colleagues. Throughout the day and seasons, the light levels adjust depending on the ambient light in the room. During a building emergency, all the lights turn on at full power for safer evacuation, then return to normal once the emergency ends. An advanced lighting system like that works by integrating various sensors and connecting to building energy management and security systems. In real life, such systems could dramatically improve energy performance. But that’s not happening yet. Why not? Today’s connected lighting systems are in their infancy, and confusion abounds. Many manufacturers are pursuing their own proprietary technologies and approaches to collecting and sharing data with other devices. It’s the Wild West of lighting. Each vendor hopes to become the standard, thus achieving a competitive advantage. Several industry groups are developing frameworks and technologies that facilitate interoperability, but they’re still in the early stages. Open specifications and standards are still in process, and manufacturers have been slow to adopt them. This initial study explored how existing commercial lighting systems receive, respond to, and share data, then recommended ways to standardize and improve those interfaces. PNNL researchers focused on testing the application programming interfaces (APIs) of early-stage connected lighting systems. An API is a snippet of computer code that can be used to make connected lights talk to each other or other devices. Think of it like instructions that tell you how to connect your home thermostat to an app on your cell phone—except in this case, it’s software that allows you to communicate with a lighting system, and to connect the data from one light to another, or to another computerized system in the building. PNNL researchers tested the APIs for six connected lighting systems made by major manufacturers. The results revealed a dramatic level of API inconsistency among brands. The lighting products differed widely in the energy data captured, such as the unit of measurement and time period. API instructions often didn’t specify the desired data accuracy and resolution. When the researchers sent a lighting command to all six systems, the lights responded at unpredictable times—ranging from 1 second to more than an hour. Only one of the six systems had a way to set the output of all the lights to maximum with a single command, such as in an emergency. APIs also used different authentication schemes, creating a range of cybersecurity vulnerabilities. PNNL researchers recommended ways to address these issues. One was to make APIs more broadly available, such as by including more of them as downloadable files on lighting manufacturer websites. Buyers are more likely to purchase connected lights knowing that they have a reliable way to integrate them with other system and monitor energy use data. Another recommendation was for industry to develop and adopt well-thought-out, standardized information models that underlie the APIs. And use lighting experts—not just information technology specialists--to create those models. The report is online; it was downloaded 400 times in the first two months. PNNL researchers are also sharing their findings and recommendations with technology developers, manufacturers, and potential users. This is the first in a series of DOE studies to document the status of connected lighting interoperability in the current landscape. PNNL's research at the Connected Lighting Test Bed is supported by DOE's Office of Energy Efficiency and Renewable Energy.